Cawston Elementary School Flag Friday on October 5, 2018, progressed as each assembly has in the past. Parents came to take pictures as students were recognized for following the code of conduct and exhibiting the positive qualities of being respectful, honest, and safe. Students were given Brag Tags for being honest, certificates for completing lessons and challenges, and classes were recognized for the average class attendance rate. The assembly was following the same timeline as the assembly before. 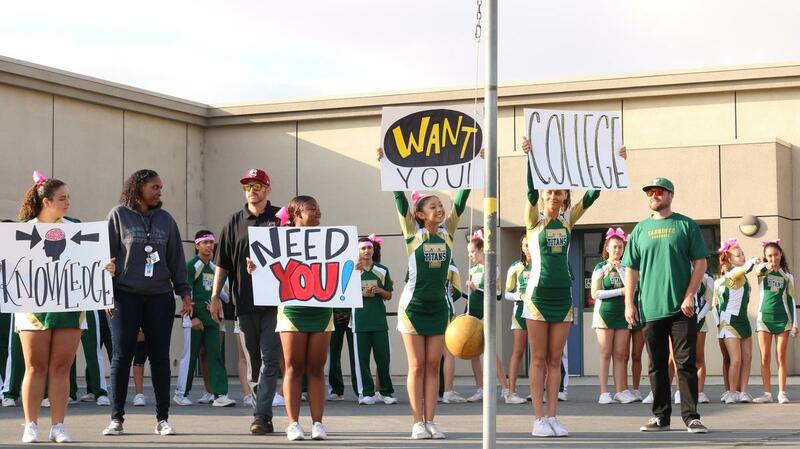 That is, until Counselor Aida Sandoval stepped up to the microphone to introduce College Kickoff! Mrs. Sandoval explained to students the importance of education. She explained that after their time at Cawston, the majority of them would move on to Rancho Viejo Middle School, and then to Tahquitz High School. She explained to them that after high school students could go to college to continue their education. She explained that their educational journey, which has begun at Cawston, will lead them to various opportunities. 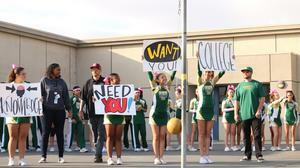 She then asked for the Tahquitz High School cheerleaders to join her on the blacktop. The cheerleaders ran out smiling and clapping as they greeted the students. “They are little ones so the entertainment value really hits home for them,” said Sandoval. The Tahquitz cheerleaders performed a dance routine complete with stunts and gymnastics. Sandoval said combining a fun performance while providing a message about college and how fun the educational journey is, will be more impactful if students are having fun at the same time. Students gasped as the cheerleaders were tossed in the air, clapped as they performed complicated gymnastics, and danced where they sat as they watched the performance. After the Tahquitz cheerleaders performed, Aida took to the stage again and invited two of the cheerleaders to join her. The students explained what Free Application for Federal Student Aid (FAFSA) is and talked about the importance of taking the PSATs and SATs. At this point of the program, a few students came up to the microphone to announce what they would like to be when they grow up. Career fields varied from an illustrator to a veterinarian. Students were then taught about high school commencement and what the meaning of the cap, gown, and tassel are. Students were then asked to join in as the entire crowd sang the chorus of a college version of “In My Feelings” by Drake. The chorus was changed to “Comets are you reading, are you writing, are you down with the knowledge? Cause I need you, and I want you to go to college!” Preceding the event, students witnessed a dance battle between the Tahquitz Titan and Bennie the Bengal from Riverside Community College. 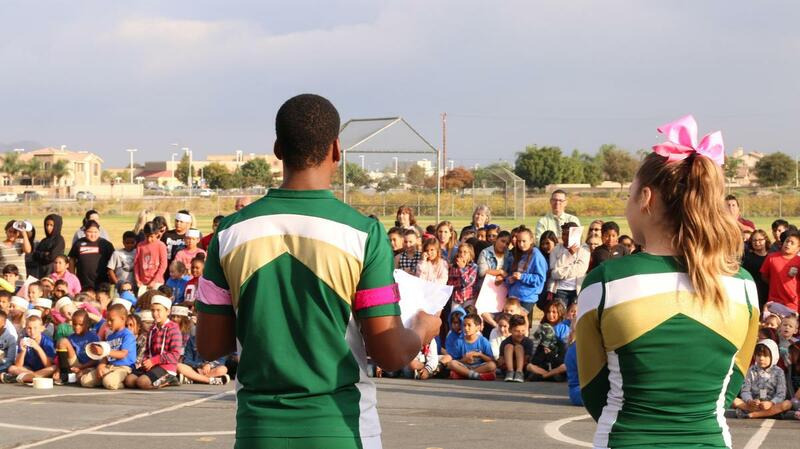 Thank you to Aida Sandoval, the Cawston Elementary School staff, Tahquitz Cheer Coach Sarah Peterson, and the Tahquitz cheerleaders for creating such a positive event for your students. It was an event they are surely going to remember!